Diameter : 1,960 × 1,518 × 996 km. Mean Diameter : ~1,500 km. Perihelion (q) : 43.34 A.U. Aphelion (Q)	: 59.73 A.U. Mean Density : 2.9±0.3 g.cm-3? Sidereal Rotation : 0.1631 hr. HAUMEA (136108), pronounced as how may a, or by its earlier preliminary designation of 2003 EL61 is one of the most unusual of all the trans-Neptunian objects. Amid much controversy, the name Haumea after the Hawaiian goddess of fertility and childbirth, and was official recognised by the International Astronomical Union (IAU) on 17th September 2008. Haumea was originally discovered on 28th December 2004 by José Oritiz and Michael Brown and first was nicknamed by these astronomers was “Santa” only because of it was found just prior to Christmas. With the mean diameter is about 1500 km across, though from its variable light curve of 0.44 magnitudes, it has been determined that the shape was more like a Rugby or Australian Rules football. Calculated size to be about 1960×1518×996 km. Unlike most of the other trans-Neptunian bodies, the rapid sidereal period is fairly accurate, spinning once every 0.163 days or 3.912 hours. Haumea orbits the Sun once every 285.31 years, whose solar distance averages at 43.34 A.U. or 6.50 billion kilometres. The planetary orbit is also moderately elliptical, whose distance can vary anywhere between 35.1 and 51.5 A.U. Perihelion last occurred in February 1991, with the next perihelion expected sometime in October 2135. Being so highly inclined to the ecliptic by 28.2°, means Haumea will stray well away from most of the zodiac constellations along the ecliptic. At the current average opposition magnitude of 17.5v, Haumae remains one the brightest of the TBOs and it is possible to be seen only in the largest of amateur telescopes. This brightness only exceeds both Pluto and Makemake — the latter being previously catalogued as 2005 FY9. This unusual body also has two known moons, named Hi’aka and Namaka. Amusingly the brightest, first found on 26th January 2005, was called Rudolph, being so close to Christmas. Namaka was discovered later in the same year on the 7th November. Provisionally they were named as S/2005 (136108) 1 and S/2005 (136108) 2. These names selected were after the two daughters of Haumea, Hi’aka the principal goddess of Hawaii and hula dancers, while Namaka was the Hawaiian water nymph or spirit. These names are very appropriate, as these moons were discovered from the Keck Observatory atop of the volcanic mountain of Mauna Kea. Interestingly, Haumea was discovered at the Sierra Nevada Observatory in Spain — so the Hawaiian is not serendipitous! Both moons orbit Haumea once every 46.12 and 34.7 days, respectively, at the distances of 39,300km and 49,500km. Separations are estimated as 1.0 and 1.5 arcsec, whose orbits are almost edge-wise to the observers line of sight. Estimated diameters for both moons are around 310km and 170km, respectively. Presently around 17.4 visual magnitude, Haumea is placed in the mid-northern constellation of Böotes some 2.3° from the yellowish 4.5 magnitude τ4 Boo (4 Boo). (This star is in the lower left hand-side of the Figure below.) Alternatively, the present general position is 4.0° from yellow 2.7v magnitude η Boo / Muphrid (8 Boo). 1897 Close approach to 1st magnitude Betelgeuse at merely 8 arcmin S (0.20°). 1898, June Close approach to Orion’s 1st magnitude Betelgeuse at merely 5 arcmin N (0.15°). 1899, May 14 arcmin North of Betelgeuse, looping it during the year. 1931 Crosses north of the ecliptic, near the position of Eta (η) Cancri. 1931, August Passes 4.9′N of Eta (η) Cancri. 1942, Sept. Placed 1°N of the Beehive / Praesepe (M44). 1944 Passes 0.2°N (7.9′) of Lambda (λ) Leonis/ Alterf/ 4 Leo on 15th September. 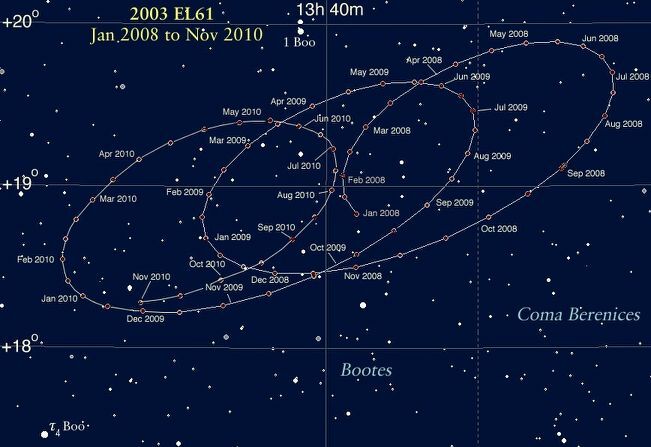 1948 Passes 0.15°SW (6.4′) of Epsilon (ε) Leonis on 15th January. 1949 Passes 0.3°NE (10.6′) of Epsilon (ε) Leonis on 7th July. The user applying this data for any purpose forgoes any liability against the author. None of the information should be used for either legal or medical purposes. Although the data is accurate as possible some errors might be present. The onus of its use is placed solely with the user.